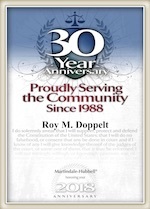 The Law Office of Doppelt and Forney, APLC practices in all aspects of family law including divorce, legal separation and paternity. We offer all potential new clients a free consultation to go over their case and discuss their legal goals. If you retain our services, we are a full-service law firm. Leave all the confusing paperwork, filings and pleadings to us. We prepare the petition and summons and all the initial dissolution pleadings for filing with the San Diego Superior Court. We will assist with the mandatory preliminary declaration of disclosures including the schedule of assets and debts and income and expense declaration. We assist with motions for child custody, child visitation, spousal support, alimony, attorney fees, residence exclusion orders and others. We represent clients in family law court in all of the court houses in San Diego County including downtown, Vista, Chula Vista and El Cajon. Last August, former NFL QB Erik Kramer said he wanted his marriage annulled due to mental issues. He and his wife married in 2017, and said he was suffering from depression at that time because of head injuries sustained while in the NFL. Thus, his marriage should not have happened because he was lacking the mental capacity to make this decision. His wife had already filed for divorce 2 days after he was arrested for domestic violence and charged with misdemeanor battery. Since California equally divides property acquired during a marriage, they would need to divide income earned over the span of their short marriage. She also requested spousal support. Why does he want an annulment? It’s likely he is requested an annulment because he does not want to split his property and pay spousal support. If the annulment was honored, he would get to keep 100% of the income earned during his marriage, and would not be responsible for spousal support. Divorce marks the end of a marriage. An annulment essentially means that the marriage was not valid and did not exist. How do you know if you qualify for an annulment? –Blood relation. If the spouses are related, the marriage is not legal. -Bigamy. If one spouse is legally married prior to the second marriage, the marriage is not legal. –Underage. If either spouse was not 18 or older at the time of marriage, the marriage may be annulled. –Fraud. Green card marriages are one example of fraud. –Unsound mind. If either spouse has a condition that prevented them from understanding what they were doing when they got married, there may be grounds for an annulment. This is common for people who were heavily intoxicated when they got married. –Force. If either spouse is forced into a marriage, they may petition the Court for an annulment. If any of these are met, you can file a petition with the Court for annulment. We recommend you speak to a San Diego divorce lawyer to help you understand your rights and whether an annulment, divorce, summary dissolution or legal separation is best for you. Call The Law Office of Doppelt and Forney, APLC for a free consultation at 800-769-4748. We proudly serve clients in San Diego and surrounding communities, including Chula Vista, Coronado, Carlsbad, Encinitas, La Jolla, Oceanside, Ramona, San Marcos, and Vista.